There is a move not only in the world , but also in our churches to do away with absolute truth. Moral relativism is the concept that there is no absolute moral standard pressing down on each one of us. Some will say that what is true for you may not be true for me. Is this concept true. Isn't absolute truth absolutely true for everyone. Someone can believe that they might not get wet if they go outside when it's raining. However, just believing something does not neccessarily make it true. Yet, those who argue this, do believe in absolute truth, and will change positions when confronted with absolute truths. For instance they will argue that what is true for me isn't neccessarily true for you. You can make up your own values. However, when they are done wrong by someone they will turn around and cry foul. By crying foul or saying that isn't fair, then they are appealing to a standard that is outside of themselves. They are inconsistent with what they profess to believe. If truth is not absolutely true for everyone then why demand justice when a drunk driver runs over your child. He might have thought it was alright to get drunk and run over your child. See how ridiculous this concept is. Liberal theologians are propagating this from their pulpits because of a bias against God and his word. They will say that we cannot know if Jesus actually said that. On the other hand they will say that it matters not if Jesus rose from the dead bodily. What matters is how does he affect your life today. We need to be consistent with our views. Either we believe the Bible or we don't. By preaching such nonsense it is evident that some do not believe what the scriptures proclaim. Relativism Feet Planted in Midair by Francis J. Beckwith and Gregory Koukl. This is another great book I had to read for LIgonier Academy's Intermediate Apologetics Certificate Course. Buy here. 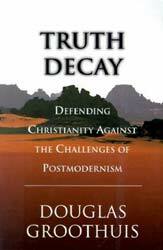 Truth Decay by Douglas Groothuis. This is another great book that I recommend. Buy here. Relativity, Moral Relativism, and the Modern Age by Albert Mohler, Jr.